PDWO members’s DWU registration fee extended to June 1st! 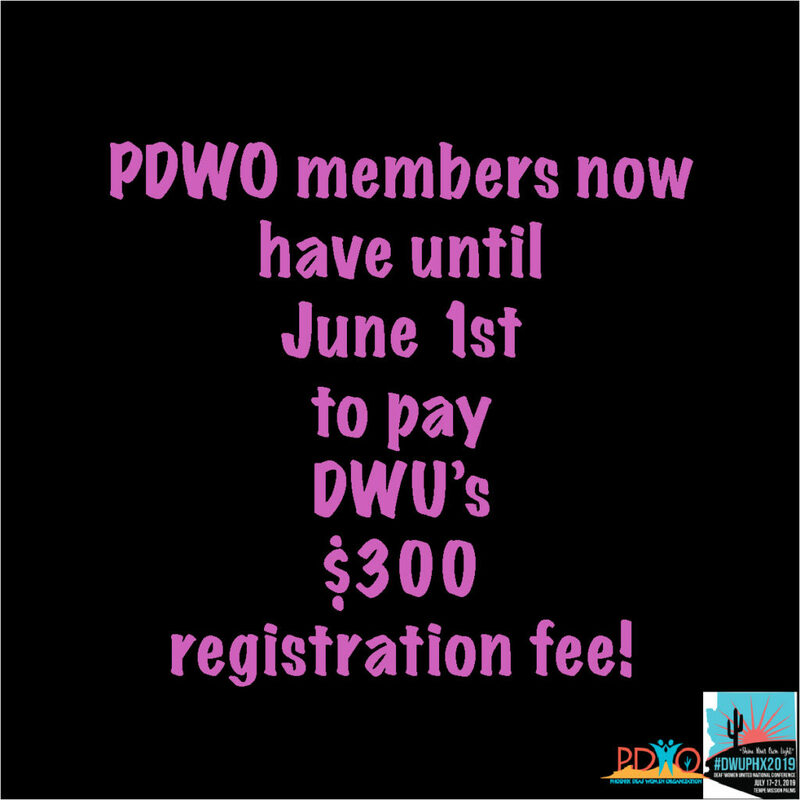 PDWO members have until April 30th to pay DWU’s $300 registration fee! 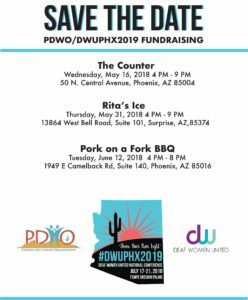 Rita’s PDWO/DWU fundraiser for #DWUPHX2019! 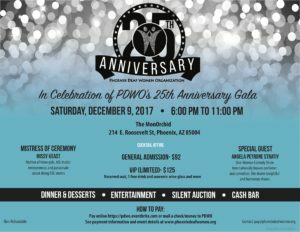 Come and be PDWO’s Secretary! Video Description: A white woman with long dark hair in black sleeveless blouse sitting in front of a white bare wall. Are you feeling hot already? Need adrenaline rush? Need some fun? Phoenix Deaf Women Organization proudly is hosting Wet ‘n’ Wild fundraising event to support Deaf Women United (DWU) conference that is happening here in Phoenix next summer of 2019!!! The water park has rides that are suited for all ages!! Take a break from school or work and join the fun sliding, swimming and riding in 12 rides and attractions! The first DWUPHX fundraiser event will be held at The Counter on May the 16th from 4pm to 10pm. The address is 50 N Central Ave, Phoenix, AZ 85004. Please click on the link below to let us know if you are going. •Donation does not include sales tax. •Donation does not include alcohol sales. •No coupons, discounts, or other offers valid during event. *Mention PDWO before ordering food, drinks or etc. Come and support the cause! Phoenix Deaf Women Organization would like to recognize and express our deepest gratitude to these organization for donating $1,000.00 to support our 25th Anniversary Gala. Thank you AZFLIS and ACDHH! 25th Anniversary Gala flyer revealed! Please send Jessica Madsen a huge gratitude for designing this beautiful flyer! 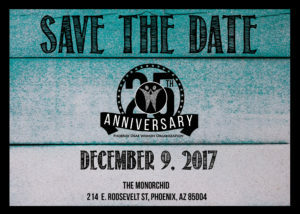 The Gala will be held at The MonOrchid at 214 E. Roosevelt St, Phoenix, AZ 85004 on December 9, 2017! We will have Missy Keast (famous for ASL Inside and a passionate ASL story teller) as our Mistress of Ceremony and we have invited Angela Petrone Stratiy as our special guest! She will delight us with her One-Woman Comedy show! Dinner, desserts, silent auction and cash bar provided! Please come and impress everyone with your cocktail attire. 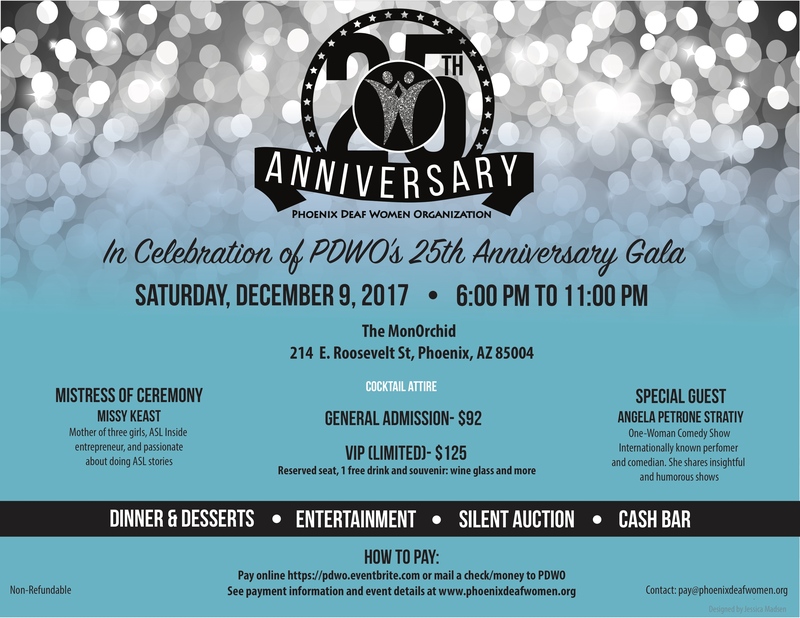 Phoenix Deaf Women Organization is hosting 25th Anniversary Gala on December 9, 2017 at MonOrchid. Ticket prices for per person are either $92 dollars or $125 for VIP which includes reserved table and more. More details will be shared soon. Any inquiries, please contact info@phoenixdeafwomen.org. 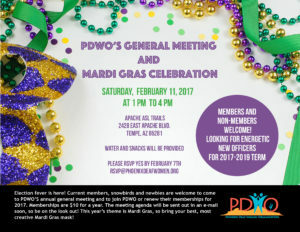 We have an exciting upcoming event- PDWO‘s General Meeting and Mardi Gras Celebration. Election fever is here! Current members, snowbirds and newbies are welcome to come to PDWO’S annual general meeting and to join PDWO or renew their memberships for 2017. Memberships are $10 for a year. The meeting agenda will be sent out in an e-mail soon, so be on the look out! This year’s theme is Mardi Gras, so bring your best, most creative Mardi Gras mask! Looking for energetic new officers for 2017-2019 term!